I’m back from my collarbone injury and feeling better than ever! As always, I have a brand new recipe to share. I am incredibly excited about this recipe because of how darn easy it is to make! 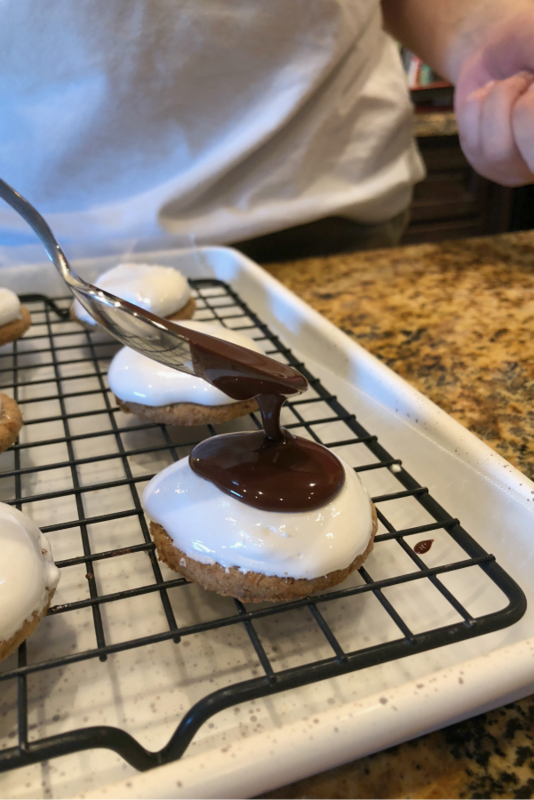 These Marshmallow Fluff Cookies consist of just four ingredients and a minuscule amount of time. These cookies are gorgeous. The chocolate coating is astonishingly smooth and enticing, which is part of the reason they disappeared from my kitchen within a day. 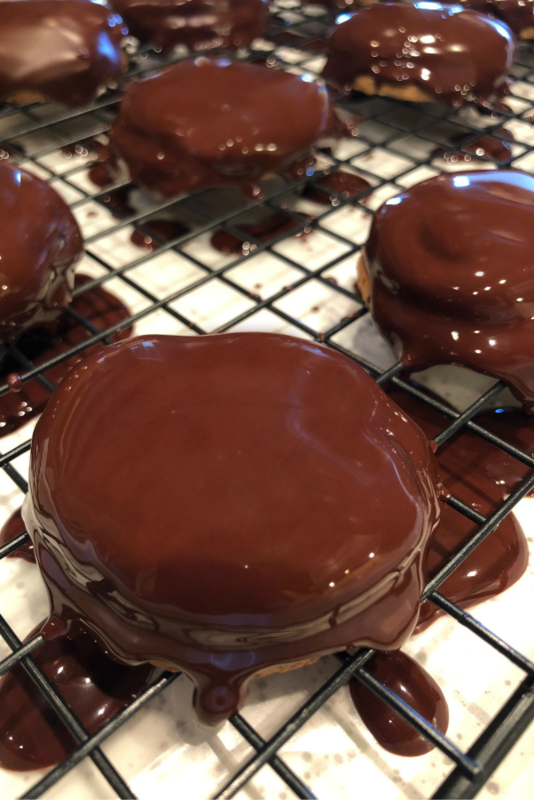 Marshmallow fluff is placed on a round whole wheat cracker and coated with melted chocolate. It’s very simple, but the end result is magnificent. There is a certain beauty within simplicity; these cookies prove that to be true. 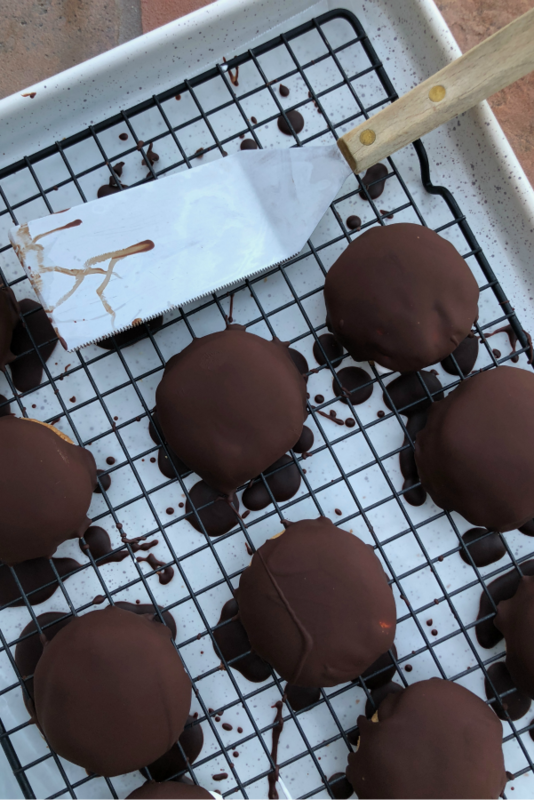 The chocolate coating will always have flaws, but it’s fun to attempt to create the perfect covering. I messed up quite a bit (as you can see), but the taste is what really matters. I found that a spoon and a half of melted chocolate was enough to cover each cookie. This might vary depending on spoon size, but it worked well for me. 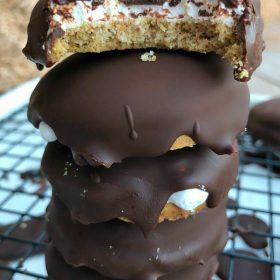 You do need to make sure you cover the marshmallow completely so it doesn’t come oozing out anywhere. I love melted chocolate. Well, I love chocolate in all forms, but melted chocolate is so cool! 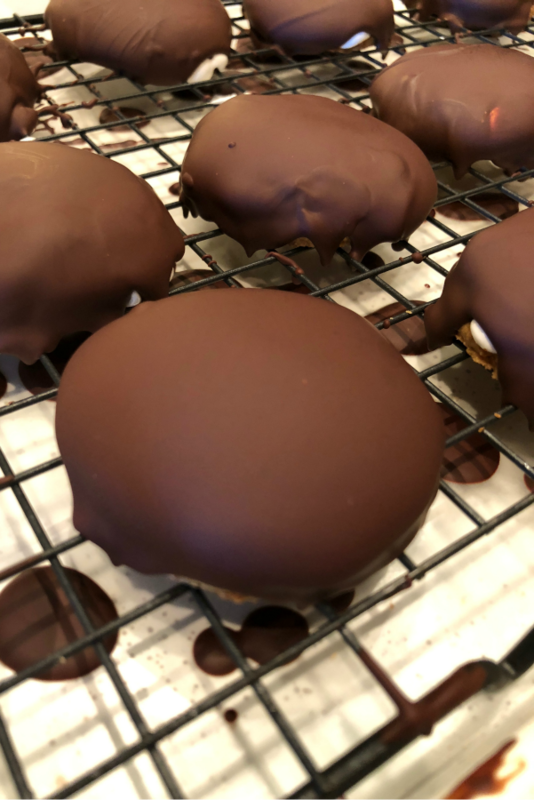 This recipe reminds me of the cookies or candies in chocolate shops that are perfectly coated and waiting to be purchased. Except there is no use of industrial cooking machinery in this recipe… It is all hand-made! These cookies are put into the freezer to harden the chocolate. We ended up keeping them in the freezer and eating them from there. I had tons of fun making these cookies. They were so simple and turned out great! 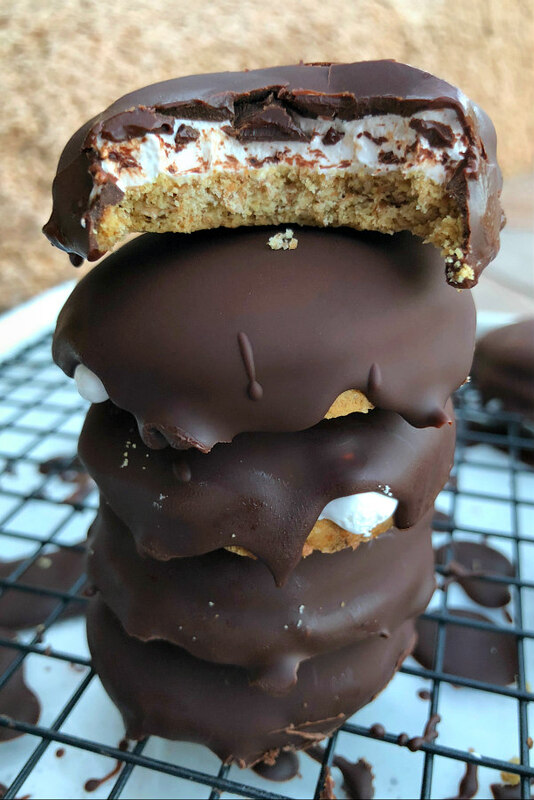 Fans of marshmallow and chocolate (like myself) will treasure this recipe. 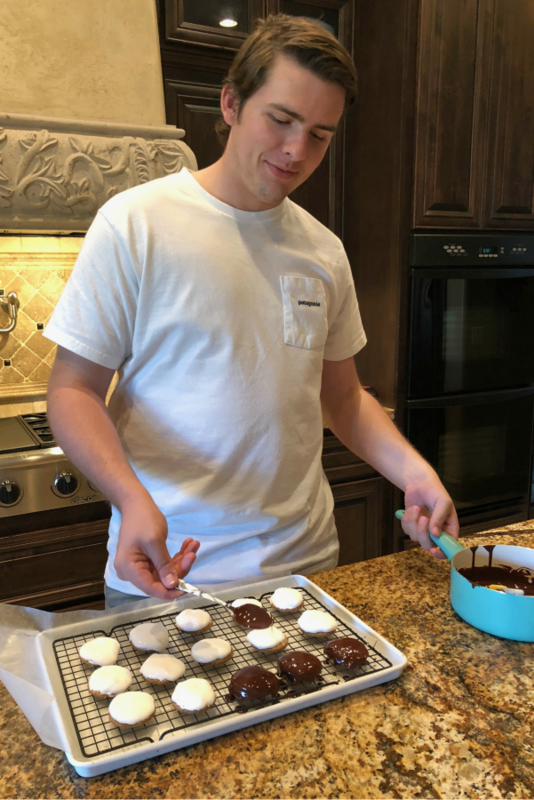 I have much experience in everything related to the dessert category, so this recipe falls directly into my area of expertise. 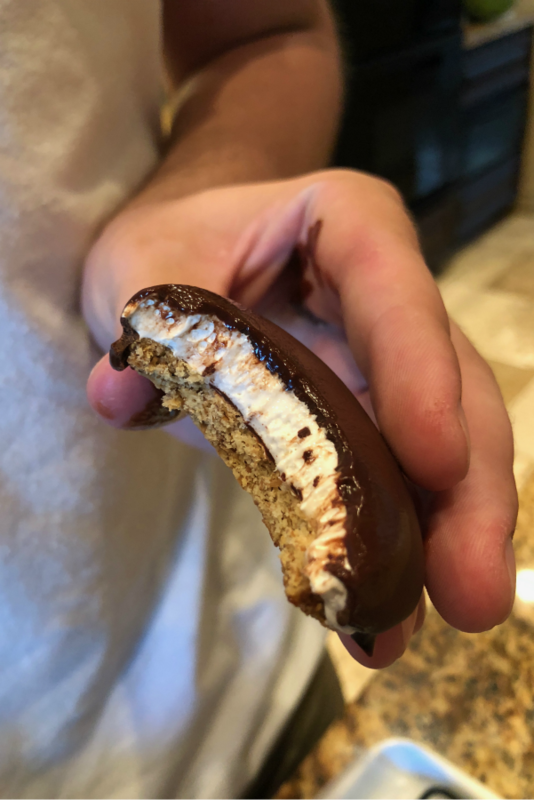 Two of my favorite sweet treats in one cookie is a phenomenal idea. The one-bite picture… It is truly iconic. 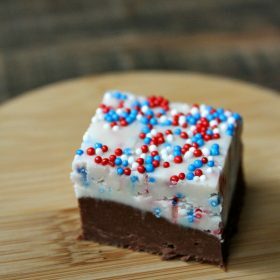 This recipe is a fantastic combination of some of my favorite sweets. The cracker helps tone down the bold flavors so they aren’t “too much” (if that’s a thing?!). These cookies are easy and perfect for any occasion. The flavors aren’t too bold, so even non-dessert lovers will enjoy. 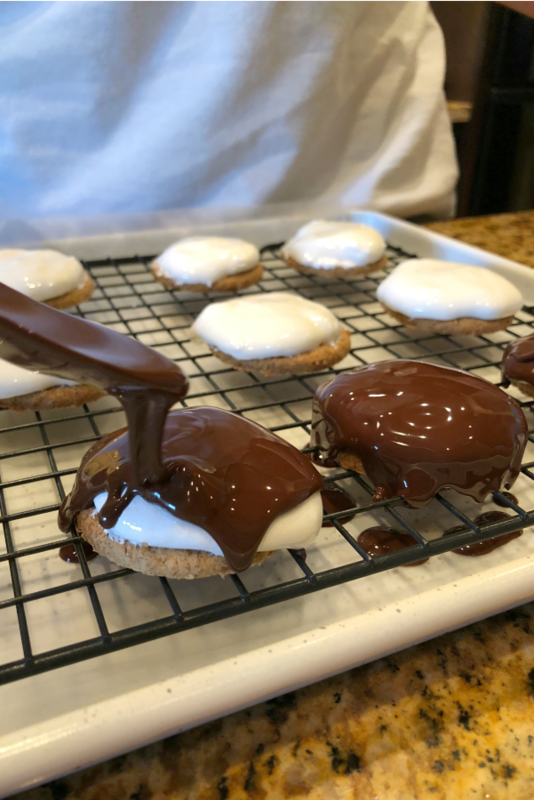 Marshmallow Fluff Cookies are kid-friendly and making them can serve as a great family project! If you’re looking for more easy cookie recipes, you might enjoy my Easy Chocolate Chip Cookie Bars or these 2 Ingredient Cookie Cups. Old Fashioned 3-Ingredient Peanut Butter Cookies and 7-Minute Chocolate Cookies are good ideas too. Set wire rack in rimmed baking sheet lined with waxed paper. Distribute crackers evenly on top of rack. Top each cracker with 1 heaping tablespoon marshmallow creme. Place baking sheet in freezer until marshmallow creme has firmed up, about 10 minutes. Stir chocolate and oil in small saucepan over low heat until melted and smooth. Let cool completely. Spoon chocolate mixture over each cookie to cover marshmallow creme completely. Return baking sheet to freezer until chocolate is set, about 10 minutes. Transfer sheet to refrigerator until cookies are completely firm, about 1 hour (or keep in freezer). Cookies can be refrigerated for up to 2 days. These cookies are beautiful! Thank you for sharing! I live in Texas and I have never heard of Carr’s Whole Wheat Crackers. The crackers look thicker than any cracker I have ever seen. They look like cookies. Do you think using Ritz crackers would be a good substitute? 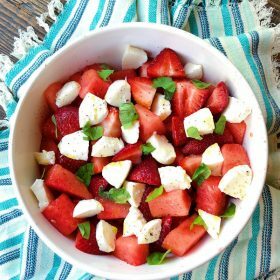 Thanks for another delicious-looking, easy to make recipe. TFS. Enjoy your day! Wow, right up my alley! Thanks, Brooks!